LADY LAYARD, christened Mary Enid Evelyn Guest, was born on 1 July 1843 at Dowlais House, Merthyr Tydfil, South Wales. 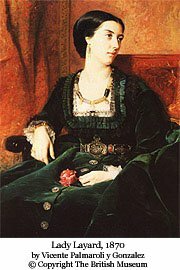 She was the third daughter and eighth child of ten born to the industrialist Sir Josiah John Guest (1785–1852), owner of the Dowlais Ironworks, and his wife Lady Charlotte Elizabeth Bertie (1814–95), only daughter of Albemarle, 9th Earl of Lindsey. When Enid was three months of age, Emily Kemble joined the Guest household as governess and became “more of a mother to us all than ever our own mother who was far oftener away from us”. Miss Kemble, affectionately known as “Temmy” or “Tem”, remained with the family until her marriage in 1868. In 1846 Sir John purchased Canford, an 11,000 acre estate and house near Wimborne in Dorset, where he removed his family. He adorned Canford Manor with many specimens and curiosities brought from Nineveh (later determined to be Nimrud) by Lady Charlotte’s cousin Austen Henry Layard (1817–94), archaeologist and diplomat. Enid’s father died at Dowlais in 1852, and Lady Charlotte added the management of the Dowlais Ironworks to her active life. In 1855 she married secondly her eldest son’s tutor, Charles Schrieber, a man considerably younger than herself. Enid, in her journal, depicts her mother as slightly formidable—referring to her throughout as “the Mother” or “the M”. Her step-father is called “Sch”, “Schrei”, or simply “S”. Enid was born in circumstances that allowed her to meet many leading figures of the day. Her marriage to a well-known and popular public figure extended these opportunities and may have sparked a determination to make daily journal entries, unlike the occasional entries of earlier years, and chronicle the events of her life and the people she met. Except for periods of personal illness and tragedy (for example, Henry’s death in 1894), Enid wrote regularly in her journal up to a few days before her death on 1 November 1912, in her Venetian palazzo, Ca’ Capello. Lady Layard’s ashes were interred near her husband’s at Canford Parish Church, adjacent to Canford Manor, on 13 December. In her will, dated 19 July 1912, Lady Layard left Ca’ Capello and £7,000 to her niece Olivia Du Cane. Among her other bequests, she gave to the British Museum her “Assyrian Cylinder necklace the cylinders having been found by my late husband in the excavations made by him at Nineveh”. This necklace is visible in the 1870 portrait by Palmaroli. The National Portrait Gallery was bequeathed the 1891 portrait of Henry by Ludwig Passani. In accordance with Henry’s will, after Lady Layard’s death the Layards’ collection of early Italian art was turned over to the National Gallery in London.With the help and advice of art critic Giovanni Morelli (1816–91), Henry had spent many years building the collection, which includes the works of Bellini, Bordone, Cima, Garofalo, and Montagna. Lady Layard’s journal covers 51 years, runs to more than 8,000 pages, and consists of nearly 14,000 entries. For the purposes of clarity and usefulness, an effort has been made to correct Lady Layard’s misspelled words and proper nouns. Where the author’s hand has prevented an accurate transcription, this has been noted. The author’s free style of grammar and punctuation has, in general, been retained. Some periods and commas have been silently supplied when necessary for sense. Occasionally, the author left a blank space for a word or name she intended to supply later but never did. These spaces have been emulated. Visitors to this website are advised that the text presented here is an unedited transcript of Lady Layard’s journal. Consequently, it is recommended that students and scholars who wish to quote from the journal should do so after consulting the original in the British Library Department of Manuscripts. See the following links. A calendar page appears for each of the years in which Lady Layard recorded her notes and observations. Select a calendar year from the left column, and click on any highlighted date to see the entry. In only one instance (1866) were no entries made. To progress through the journal, simply click on “Following Entry” or “Previous Entry” or go to the Search page and enter specific words or phrases. The presentation of Lady Layard’s Journal online was made possible by a generous donation from the Bob and Anna Wright Family Foundation of Vernon, Texas.